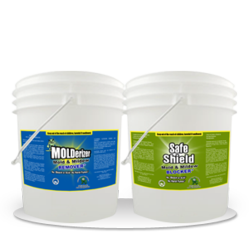 Molder.com has released its new mold remediation products that help mold contractors save thousands in remediation costs. The non toxic mold kit is formulated specifically to reduce the labor in a mold remediation project. To prove the effectiveness, Molderizer.com is releasing complimentary samples to mold professionals for a limited time this week. Molderizer.com for a limited time is offering a complimentary sample of its two flag ship mold cleaners and prevention products. Be sure to visit Molderizer.com for more information and to grab your complimentary sample. Molderizer.com has announced a new cost saver for mold professionals. The mold remediation products which were previously only available to select environmental companies is now being released to mold professionals and the rest of the public. The non toxic formula is called Molderizer and contains no harsh acids, fumes, chemicals, or bleach. The clear mold killing solution is comprised of natural ingredients in which destroy the DNA makeup of mold spores, thus immediately destroying any mold causing allergens. Initially, Molderizer.com special formula was licensed to select few large environmental companies in the United States. Now after rigid testing and renewal of their agreements, the creator of the mold remediation product is releasing a complimentary sample for a limited time to the rest of the public. The director of relations explains, "Currently, Molderizer.com is extremely excited with it's huge success with other mold professionals. The company has helped professionals drastically reduce mold removal costs and labor costs when involved in a mold project. To prove it's amazing results and labor saving abilities for mold remediation companies. Molderizer.com for a limited time is offering a complimentary sample of its two flag ship mold cleaners and prevention products. Be sure to visit Molderizer.com for more information and to grab your complimentary sample." The mold help site is releasing a complimentary sample of its mold kit, which includes Molderizer and Safe Shield. One may be able to visit the website and claim both samples for a limited time.